Help thaw out and free multicolored fish in this simple yet fun color matching fast action puzzle game downloadable on Nintendo Switch. To play simply tap two fish anywhere on the playfield to swap them out. If you can get four or more of the same color next to each other horizontally and/or vertically, the ice will crack, and after a second, the fish will break free and you’ll earn points. While the ice is cracking, you can match more fish and if you can free many fish of the same and/or different colors at the same time, you’ll boost your score! There are four main modes of play. In Minute Match, you have only one minute to get as high of a score as you can. In Wave Mode, you must reach a certain score in a given time to go onto the next wave. 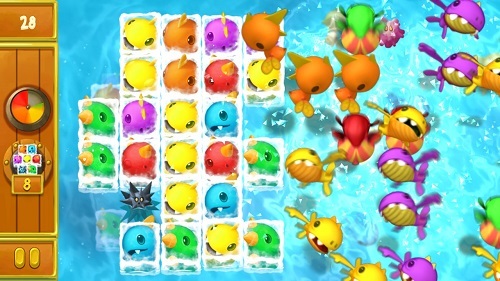 In Fish Fight, you must keep making matches so the freed fish can prevent a larger fish from reaching the surface. If you can get the giant fish to stay on the very bottom long enough, you’ll defeat it and unlock even harder monster fish! Finally is Puzzle Mode, where you have limited moves to clear out pre-arranged patterns of fish. You’ll earn bronze, silver, or gold medals on each level depending on how many moves you use. You can also view local high scores, and the more you play, the more power-ups get unlocked. These help you clear out fish, take away or freeze unmovable sea urchins, slow down time, and more! The only problem I had with the game is that it’s only truly playable if you have the Switch out of the dock and can use the touch screen. The game will let you play on the TV, and use the Joy Con to point a cursor on the screen to perform actions. But it’s so much faster to just tap on the screen and you won’t get very far otherwise. But other than that, this is a fun little puzzle game. It may be better suited for mobile devices, but it’s still nice to be able to play a game like this on a console and not have to worry about in-game ads or purchases. Plus the price is pretty reasonable, too! Other than a giant cartoon fish eating a bunch of little fish, there’s not much in the way of violence in this game. Reading skill is helpful for some of the text, but not necessary just to play. Swap This! is rated E for Everyone.